England’s Chief Inspector of Hospitals, the Care Quality Commission (CQC), has rated Sussex Partnership NHS Foundation Trust as Good. and specialist community mental health services for children and young people. Our services at Avenida Lodge and Lindridge Care Home are inspected separately. Their ratings and individual reports are below. Speaking after the rating was announced, Sam Allen, Sussex Partnership's Chief Executive, said: At Sussex Partnership, we value the CQC’s role in helping us improve care and treatment for the patients, families and local communities we serve. I’m delighted we have moved from ‘requires improvement’ to ‘good’ because it reflects our passion for providing high quality patient care and working with carers, families and our partners to learn and improve. I want to say a huge thank you to everyone involved in helping us do this. 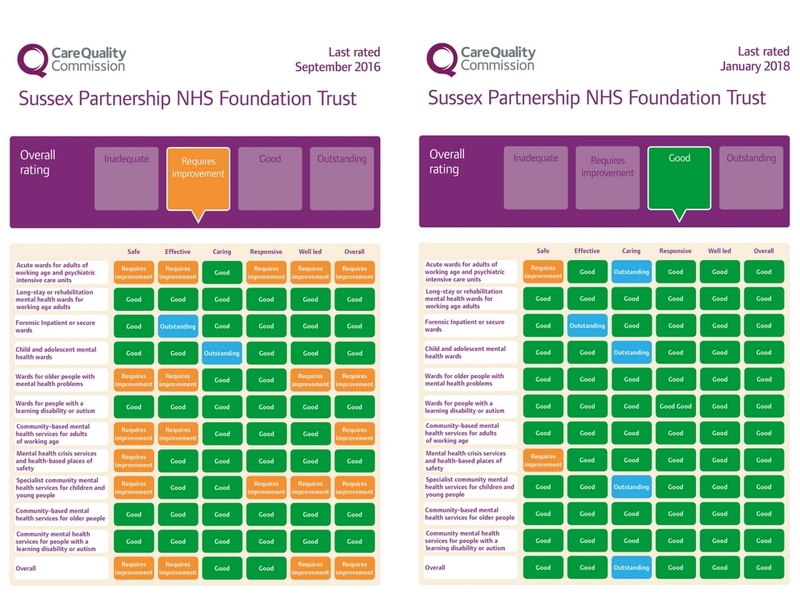 The CQC's Deputy Chief Inspector of Hospitals (and lead for mental health), Dr Paul Lelliott, said: “Previously we rated services at the Sussex Partnership NHS Foundation Trust as requires improvement. I am delighted that the Trust has taken to heart the findings from that and built on them to improve. We have found that the trust board and senior leadership team has put its clear vision and values at the heart of the organisation, working hard to make sure staff at all levels understood how this relates to their daily roles. You can read our previous CQC inspection report here.